I only really make cookies at one time of year (December), but I am always looking for a new and fun recipe, or a variation on an oldie but goodie. Last year, we revamped our moms’ thumbprint cookies to a chocolate variety, filled with cherry or orange preserves. The cherry version was a real hit, but the orange came off a little bitter alongside dark chocolate. This year, we are making old standbys, for sure, like the Bun’s Mexican Wedding Cookies shown above; he used to make them for his Nana because they were her favorite cookie, so they always have a place in our cookie tin. However, we are brainstorming some future favorites, too, and in some unexpected ways. For the most part, I gravitate toward either spicy or chocolate-y cookies, so I think it may be fun to combine these flavors in a chocolate-ginger cookie, or one with a lot of cinnamon and nutmeg. Another idea I have is to make a gingerbread dough without the heavy molasses, making a lighter colored, but spicy cookie. However, I fear that the texture might suffer, since I think that the molasses is what gives the cookie that signature chewy texture. The goal on that one is to let the spices (cinnamon, ginger, nutmeg, allspice, clove) take the lead on flavor. Pushing the envelope a bit, I suggested to the Bun that we revamp what people in Chicago (and my hometown in Pennsylvania) call “Kolache,” which are these little cookies that are a square of dough with two corners folded together over a jam or sweetened-cheese filling. My idea is to make a cardamom-flavored dough and fill the cookies with an orange-flavored cream cheese. The test cookie turned out pretty well, but the dough really does need to be chilled overnight before you try to roll it out and bake it. I decided to fill them with mascarpone cheese that I sweetened with sugar (to taste) and flavored with both grated orange zest and a little orange flower water. * They make for a little more exotic version of a traditional cookie, so please give it a go, if you feel adventurous! I should have a cookie update later today or over the weekend. Anyway, I am sorry for the many delays in posting. I can’t make any promises, but my hope is to really ramp up in the new year with posts throughout the really wintry months in Chicago. Until then, I’ll keep posting when I can, even if I am just getting a few pictures and writing a few lines of text. I hope to keep you entertained! *Available in Indian food stores and online at our local (excellent) spice merchant, the Spice House (www.thespicehouse.com); be sparing with this ingredient, as it tends to make food taste perfume-y, if you use too much. 350 degrees. Combine 1 c. butter and sugar in large bowl; beat at medium speed until creamy. Add egg yolk and maple flavoring; continue beating until well mixed. Reduce speed to low; beat, gradually adding flour and pecans until mixture forms dough and is no longer crumbly. Shape dough into 1-inch balls. Place 1 inch apart onto ungreased cookie sheets. 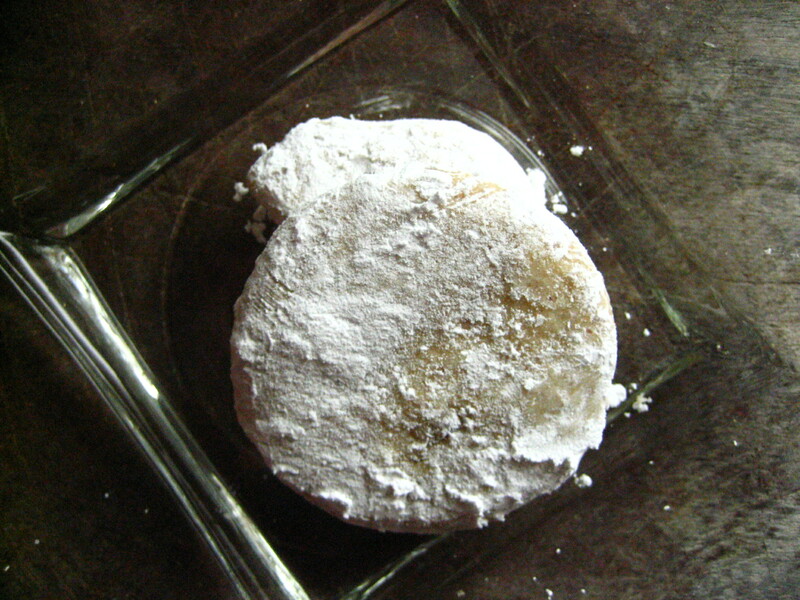 Bake for 9 to ll minutes or til cookies puff and start to turn light golden brown. (Cookies may crack.) Cool 1 minute on cookie sheets; remove to wire cooling rack. Cool completely. Melt 1/4 c. butter in 1-quart heavy saucepan over medium heat. Continue cooking, stirring constantly and watching closely, til butter just starts to turn golden (3 to 5 minutes). Immediately remove from heat. Cool 3 minutes. Add all remaining frosting ingredients; beat with wire whisk, adding enough half & half for desired consistency. Dip tops of cooled cookies into frosting; sprinkle with chopped pecans, if desired.